On the roadside at Tully Gardens there is a holy well dedicated to St. Brigid. It is shown on the 1837 Ordnance map, as well as pointed out by tradition. It was walled in by the Board of Works, and was used by the townspeople before the water from St. John’s Well in Tully East was piped to the town in the early eighties of the last century. From time immemorial too, Brallistown, or as it is called locally the Greallachs, in the west of the same townland has been a place of pilgrimage as being associated with St. Brigid. Greallach means miry marshy ground on which cows stand. Tradition states that St. Brigid kept her cow here, prayed here, and made butter beside the stream. Her well is pointed out and her “Shoes,” or as they are also called her “Cows” are objects of veneration. These are two granite stones, 32 inches by 12 inches, hollowed out so that the stream water passes through them. 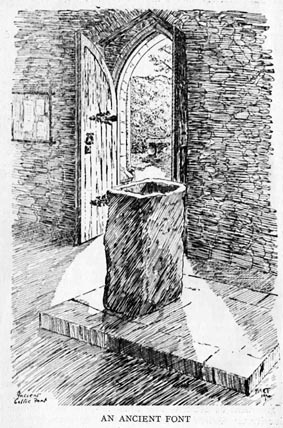 According to the flow of water through each of them at certain times of the year, it is said that one cow is “going dry” or is dry, and the other is “a new-milch cow,” or “in full milk.” Owing to the cleaning of the larger stream and the stream from the well, the position of the Shoes or Cows has varied, from the mouth of the well-stream where they seem to have been sixty-two years ago, to a place between the mound and the whitethorn bush. They seem to have been placed in the latter position over thirty years ago, and to have remained here till the Shrines were renovated by the people of Tully in the autumn of 1952. Pilgrims have always prayed on the Mound beside the stream. At noon on Sunday, St. Brigid’s Day, 1953, the Parish Priest blessed St. Brigid’s roadside well at Tully and then proceeding to the Greallachs, in the presence of several hundred parish­ioners, he blessed St. Brigid’s Well and her “Cows” or “Shoes.” All then joined in the recitation of the Rosary at the seven station-stones, and in a hymn to St. Brigid.